One of the stories my uncle Laurence Turner wrote when he was the Melbourne Herald correspondent ‘with the Australian troops in Malaya’ 1955-56 was headlined ‘Ghost camp in Malaya’. It was published on 1 or 2 February 1956. The story is listed in the Herald by-line file cards now at the State Library of Victoria, but not in the microfilmed copy of the paper. Luckily a battered copy of the story was found in my uncle’s papers. Perhaps the microfilmed copy was only published in an early (or late) edition of the Herald. 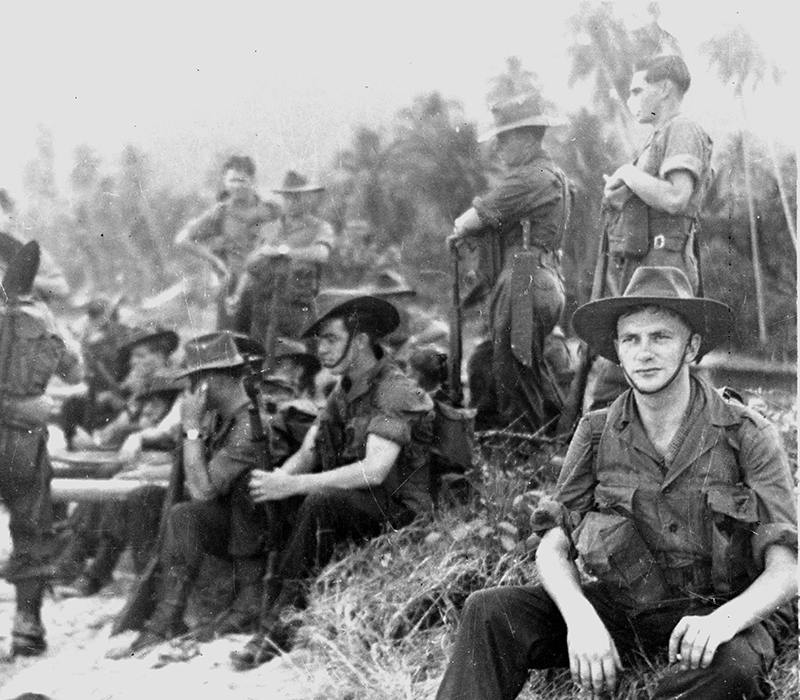 In January 1956, Turner ventured south to Singapore and some of the places in Malaya where Australians fought in 1942. He’d written about schools in Singapore, the Kranji war cemetery, Raffles hotel and other matters – none of which seem to have been used by the Herald, but may have been picked up by the Sun News-Pictorial Melbourne, the West Australian, Brisbane Courier-Mail, Adelaide News or the Sydney Morning Herald. In his five months with 2RAR in Malaya, he scooped AAP-Reuters with stories on the first ambush of Australian troops, the death of Sergeant Cecil Anderson, the January 1956 peace talks at Baling, the bungling of housing for the families of Australian troops and the shoddy conditions of Australian troops, including the docking of the Malaya allowance of soldiers while ill or wounded in hospital. His stories were influential in improving conditions for the men and their families for the duration. A keen student of Australian military history, Turner visited the Second World War sites in Malaya – Parit Sulong where 107 Australian wounded were massacred by the Japanese on 22 January 1942, and the site of the successful ambush at the Gemenceh River near Gemas on 12 January 1942. In January 1956 Turner met Michael Mathews a high school teacher at Batu Pahat, now (and then) a small coastal town between Johore Bahru and Malacca. In late 1941 it was the main Australian base in Malaya. The men Mr Mathews met were mostly from the 2/30th Battalion and the 2/10th Field Ambulance, part of the tragic 8th Division. They had arrived in Singapore in August 1941, stayed at Birdwood Camp at Changi, and then moved some 90 kilometres to Batu Pahat in late September. The 2/10th supported the 2/30th in January 1942 in the first Australian action against the Japanese – at the famous ambush on 12 January at Gemas on the Gemenceh River. The 2/30th suffered 20 killed or missing believed dead and 58 wounded in Malaya in January. The Japanese casualties were thought to be about 1,000. After the surrender in Singapore, 1150 of the 2/30th were made prisoners of war. Many were sent to work on the Burma-Thailand railway, others to Borneo, or Japan. Over 300 men from the 2/30th died during captivity. Turner recorded nine names but couldn’t answer Mathew’s question. I have details of what happened to eight of the nine. One name I have so far been unable to track down is NX 4377 Pte D.O.R Blair, C Coy 2/30th Bn. Christmas card 1956 from Michael Mathews to Laurence Turner and Bruce Reddaway, Herald photographer. While researching my book Men of Kapyong (in progress) I came across Sergeant Cecil Charles Anderson who served with 3RAR, but was wounded at Chongju and missed Kapyong. He was, like Reg Saunders, an indigenous soldier. Sergeant Anderson was a Second World War veteran, having served with the 2/2nd Independent Company in New Guinea. He was killed on patrol with 2 RAR during the Malayan Emergency in 1956 – and was awarded a posthumous MID for his bravery and leadership. Here I discovered a poignant connection. 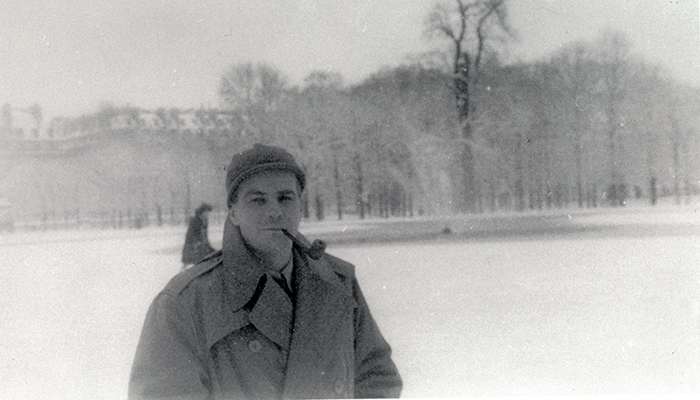 My uncle Laurence Turner was a journalist with the Melbourne Herald, and was ‘embedded’ with 2RAR in 1955-56. He was there when Sergeant Anderson was killed– and attended his funeral at Taiping. 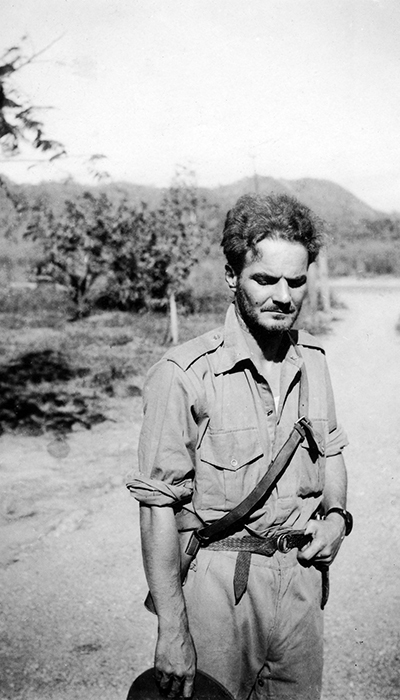 “Osmar White was not only one of the finest correspondents of the Second World War but also a visionary writer and philosopher of courage and conviction” : – Phillip Knightley, author of First Casualty. Osmar White was born in New Zealand in 1909, and worked in Sydney in the late 1920s before moving to South East Asia and China, where he wrote features and short stories for Australian and American papers. Around 1934 he returned to New Zealand, and then joined the Melbourne Sun News-Pictorial in 1937. He enlisted in the AIF in 1941, but was ‘manpowered’ out by Sir Keith Murdoch who said ‘Oh we don’t want you rushing around with a pack on your back, you’ll fight the war with your pen, dear boy’. Kenneth Slessor’s reaction to seeing two Australian graves in Lebanon was critical to the composition of perhaps his finest poem, Beach Burial. Kenneth Slessor wrote (25 November 1941): ‘Driving back along the coast I stopped at a smashed police post not far from the Litani River [just north of Tyre] and stood for a few moments at a little cluster of Australian graves. They were huddled together, as if taking cover on a slope of a hill. Behind them a ripple of young maize came to life in the wind, still defiant of the shells, which had ploughed it. The crosses were the simple sides of packing cases nailed at right angles and the inscriptions, written with careful clumsiness in indelible pencil, had been smeared violet by the rain. The two comrades lay side by side facing the white beach and the blue sea, so piercing blue that it might have been stolen from their South Australian coast.